Combine all ingredients in small bowl and mix together. You can make this recipe with half of the oil and still get excellent results. You can also cut the recipe in half, using a smaller egg when cooking for just one or two people. 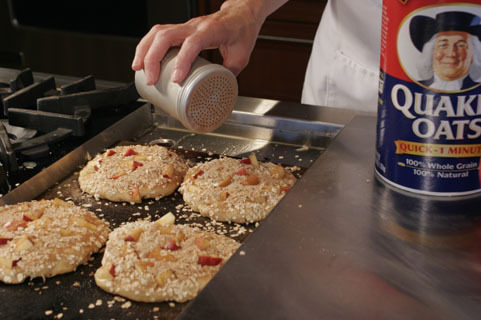 1) Apple Pancakes: Chop any variety of apples into smaller pieces and then use them, seared with the oats and cinnamon-sugar. 2) Hawaiian pancakes: Add pineapple pieces, macadamia nuts and coconut seared on the top.